Surthrival Colostrum – Hyped Up Marketing Or Actual Quality? If you're reading this, then you've probably come to the exact same place where I found myself on my journey to find the best colostrum product available on the market, as there are many, and as per usual, the hype is extremely plentiful as with many products in the supplements marketplace. Quick Note – Jump to a spot on this page if anything jumps out at you! 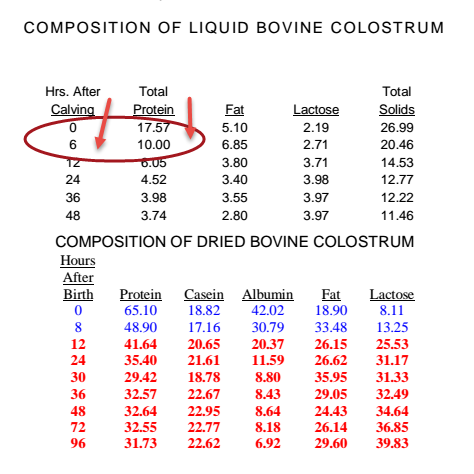 Surthrival Colostrum Product Features – What's In It? Why Choose Surthrival Over Other Brands? What's a Good Single Dose Amount Of Colostrum? How Much Colostrum Should I Take Per Day? How Many Times Per Day Is Optimal For Best Benefits From Colostrum? Do I Keep Taking The Same Amount? How Long Should I Take Colostrum For? 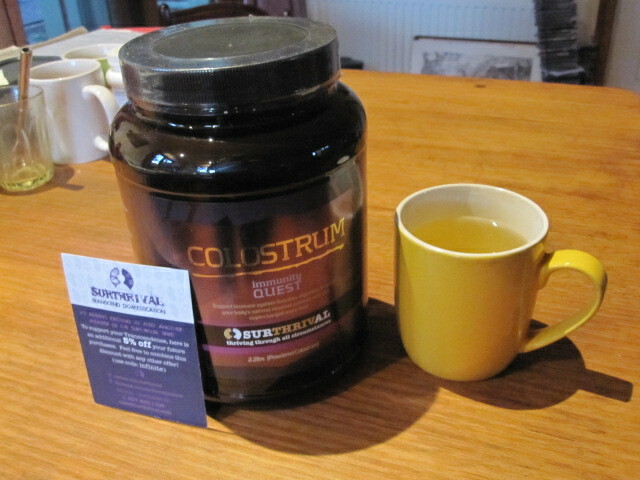 What Does Surthrival Colostrum Taste Like? How Long Does It Take To See Results From Colostrum? Where To Find It For The Best Deal? Does Anything Compare To Surthrival Colostrum? Whether or not you're looking for the ultimate colostrum because you've heard that it's awesome at healing leaky gut and repairing a damaged gastrointestinal tract (that was my main reason for becoming a colostrum geek, at least to start with – you can read up in WAY more detail about colostrum and leaky gut here), or you want the immunity boosting properties, or you're just one of these modern “fitness hackers” who wants to get an edge so you can positively boost your athletic performance in sports or at the gym. Does the Surthrival brand of colostrum live up to all the marketing gobbledygook, or is it all just fluff, designed to fill the pockets of opportunistic business types who have spotted the new colostrum craze taking off!? Surthrival colostrum is touted as one of the higher quality versions of colostrum that's available, and I must say here that when I was reading over the technical specs regarding the product, while sure they looked good (at least as far as I could understand them at that point on my colostrum educational journey, until I learned more about the “sciencey” stuff) it was the ethical production practices which stood out to me, and made me think that maybe these guys really cared, not only about the client, and making money, but about the whole process. In my mind, that kind of got my attention. Okay, Sounds Cool, But What's In Surthrival's Colostrum? So when you read those product features compared to other types of colostrum supplements on the market, it's sounding very good so far… If you're like me when I was going through this process though, when they start talking about the 97 Immune Factors and 87 Growth Factors in the product, I start to get a little lost as to how exactly that benefits me. I'm just going to tell you now quickly which of their product features matter, and why it sets the Surthrival brand of Colostrum apart from the others. Well obviously if you have an ethical bone in your body this is super important. Otherwise by the harvesting of Colostrum for us humans to use, without ethical practice, you'd be supporting a company that may be killing, if not seriously downgrading the health and longevity of the calves affected. I consider this one of the most important differences with Surthrival, and obviously they must also, as they've listed it as their number one product benefit/feature. Again, this is a BIGGIE. The reason being that colostrum actually is only considered colostrum based on the time frame in which it is “harvested” (that word sounds creepy in this context, but I'm hoping you know what I mean anyways) from the calves. If you look at this chart you can see that there's a certain specific timing to Colostrum coming from the female, otherwise it ain't actually Colostrum, but it's what is known as “transitional milk”. The main difference here is that colostrum (taken within 6 hours of calving) has much higher protein levels, and that's why colostrum is filled with all the wonderful proline rich polypeptides that have such amazing benefits for our health (these are basically a type of protein, but a rather special type in terms of it's affects on building the immune system). I don't know about you, but I try to eat mainly organic, and the main reason for this is of course that I don't want to eat chemicals (we are already bombarded daily by enough toxins without ingesting them along with our food), so it goes without saying that I consider it EXTREMELY important not to have chemicals used in the supplements I take wherever possible. So this is a good call from Surthrival again. Again, really important. I want to get the most benefit out of taking this stuff, especially seeing as it's not that cheap, although it works out okay when bought in bulk (hence why I buy the 1KG version (Amazon link) at a minimum). Yes, ABSOLUTELY CRUCIAL to the validity of the product, and this is yet another reason why I chose this brand over the others. Colostrum is called “nature's most complete food” for a reason. 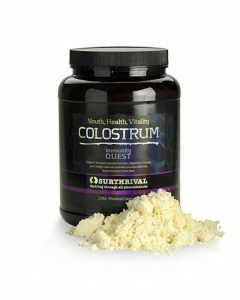 If there's super foods, then colostrum may just be the GOD of foods!! Well, I'm being semi facetious here of course, but this stuff does amaze me with how it works, and what it can achieve in the field of human health. And, a little bit cheesy I might add…. that grin 😀 hey, he's having fun with it I guess. Anyway, here's the links to the 2 of the studies on pubmed.com that are relevant to what Vitalis says in the video about colostrum being more effective than flu vaccine! both very eye opening! I know that Immune Factors and Growth Factors are one of the main benefits of colostrum, and why I wanted to add it to my daily supplements. I guess, in simplistic terms, one way to think about this that really makes it a lot easier on the old brain, is that more is better when it comes to Immune and Growth factors. After all, what do “Immune Factors” do? Again, keeping it simple here, they BOOST your immune system, which means you can save money on Doctors bills. I'm all for that. Pretty much the same deal when it comes to what they are calling Growth Factors. We want as many as possible. It's a little bit like basic nutrition, in that the more diversification of nutrients you have, the more likely you are to have a good healthy system. Let's get a little more technical then, because for those of you reading this who are like me, without getting a degree in food science, you do like to know a little bit about why the things you're paying good money for, and then trusting to put into your body are actually going to be helping you (or damaging you, if you're accidentally getting the wrong stuff). Firstly, if you really want a thorough overview, then download and read this guide on the science behind Colostrum and how it works to treat various illnesses. If you still are not satisfied then I suggest you read up on our page on Colostrum and leaky gut, as I go more into how colostrum works, and you'll probably get some good nuggets of information on how Colostrum works there too. Why Choose The Colostrum By Surthrival Over The Many Colostrum Choices? Assuming you've already done a little research into the colostrum choices here (if you haven't, great, you saved yourself several hours that it took me to figure all this stuff out! 🙂 ) then you'll already know that there's quite a fair amount of choice out there. So why is Surthrival one of the leaders in providing high quality colostrum according to myself along with many others, and it seems a rather fast growing group of raging fans. For a start, not many companies have ethical practices that come anywhere near those employed by the producers of this product. Making sure that the calves are FULLY nourished before even touching any of the remaining colostrum is super important if you want to be able to get to sleep at night, and not have nightmares about being some kind of silent demon calf murderer. What's The Right Dose Amount For Me? When it comes to colostrum, it's one of those supplements where you really have to personalize your dosage based on your situation. When it comes to these kinds of questions, please bare in mind I, and the team here at healthvibed.com are NOT health professionals, and as always you need to use your own common sense when it comes to taking any new supplement, no matter how safe you think it will be. All that being said, you probably want to start off small, and work your way up. The method that I myself use is to start off on 1/2 a teaspoon, and then work my way up. I've read that anything up to 2 TABLESPOONS per day of this brand of colostrum is okay, again, use your own judgement, and get always seek professional advice. When you are just starting off. I would probably just go with 1/2 teaspoon 2-3 times per day to start off, and see how it feels. Then after 4-7 days, if you get no bad reactions from that dosage, then work your way up. Maybe jump it up to 1 level teaspoon, then 1 heaped teaspoon after that's safe, etc, etc. Personally for myself, I just do 1 heaped teaspoon of Surthrival Colostrum with about 200 ml of water, just before I go to bed. I also have my Immuno PRP spray at the same time (this is a more refined spray derivative of colostrum, which has been shown to have amazing affects on building cognitive immunity – read more about it here). I then rinse and repeat the exact same process early in the morning when I get up to pee, usually probably around 5am. It's best to take Colostrum at night/early morning on an empty stomach. Same deal with the PRP spray. How Much To Supplement Per Day? As stated above (see the first question/answer), this will really depend on your situation, so best to get professional advice, and usually better to start off smaller and work your way up to make sure of no adverse reactions. How Many Times Per Day Do I Take This Colostrum? Again, we've mentioned this one, but basically 1-3 times per day is the standard. Again, you'll want to work your way up, start safe, and always get professional advice first. Keep Taking The Same Exact Amount? Personally if it was me, I would be always supplementing with a bit of colostrum based on the amazing benefits, and the fact that it's so good for your immune system and keeping it “well tuned”. If you're getting those amazing immune benefits, then surely you're going to want to stay at that level of health? Yeah, But HOW Shall I Take It? You can take it mixed with either water or any other relatively neutral beverage choice. Obviously It would be stupid to mix it with coffee or alcohol. Common sense prevails here. Similar answer to “Should I Keep On Taking It?” – If it's working well for you, then you'll probably be benefited by continuing on with it at some dosage consistently. What Does Surthrival Colostrum Actually Taste Like? How Long Until I'll See Some Benefits? Impossible for me to say. But I have read reports that some people noticed changes within DAYS. Other people had to wait a certain amount of weeks, even a couple of months, but said the benefits were well worth it, and they were glad they stuck with it. 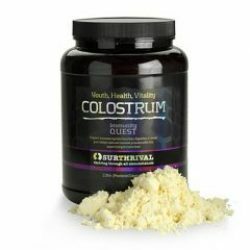 Where To Get Surthrival Colostrum? So if you're still reading at this point, you're probably starting to get a glimpse how effective I think this supplement can be (especially, and mainly for healing the gut), and you may be starting to come around to trying it out for yourself. It seems the 2 best options for purchasing surthrival colostrum are either from the manufacturer direct, or from Amazon. How Can I Get a Surthrival Coupon Code? However, please do check back here, because I am actually in personal touch with Danial Vitalis at the moment to find out if we can get healthvibed.com readers some kind of deal by way of a coupon code for their colostrum and possibly other products like their Surthrival pine pollen. So Surthrival Colostrum Is Pretty High Quality, Are Any Other Products Similarly As Good? Apart from the Surthrival brand, there's only one other brand that we really think cuts the mustard, and funnily enough, as we just found out today as I'm writing this, it's actually the same product, but with a different brand name. It's just private labeled! The product I'm referring to is Immune Tree Colostrum (Amazon link). Given that it's virtually the same price (a few cents difference last time we checked) and it's the exact same product – the owner of the originating company (Immune Tree's founder Dr Anthony Kleinsmith) told me this himself in an email, as I'd already basically guessed it was the same product. You're also getting that same, university certified product when you get Surthrival colostrum. Win win win!!! So if you want to read up on this other version of the same product, well we've got you covered, we've also separately reviewed them on another page on this site. If you want to get that version, then you can do so here, BUT, of course there's absolutely no need to waste your time in reading up on Immune Tree (unless you're a gut health nerd like me) seeing as it's the same darn stuff. Okay, so obviously I'm a big fan in terms of this specific version of colostrum being one of the best of its kind. So okay, you want to know one more time, why I think Surthrival colostrum is one of the best options. That's it! rant over, I hope that in this Surthrival colostrum review I've successfully communicated with you and shared with you the power and benefits of colostrum, and just why I think that investing in your health via going with the Surthrival brand of colostrum is a smart move. The best deal for it was found here, as of the latest posting. We'll be keeping up with that, and be sure to post if we find a better deal. Also please comment, like, share, tell your friends, your friends cat and dog, and any random strangers that you meet on the street. We love you for sharing your opinions, good or bad. So comment below on this page, or hit us up here on our contact us! Product Description: Surthrival's colostrum is about as fresh as you'll find.Ethically produced with very specific standards in place, if you're looking for the healing benefits of this supplement, Surthrival may is one of the best choices you can make. I know that colostrum is wonderful for your immune system but had no idea how great it is for brain function, with apparently no bad side effects. I love that this ethically collected. Being a farmer/ rancher I understand the absolute imperative need for colostrum in baby calf’s vial function. We always make sure a calf or lamb nursers within short time of birth. Of course human babies need it for life as well. Perhaps this is something I will have to try for brain function and immune building. Thanks for the great info! This product is intriguing. I am certainly aware of all the immunity benefits of human colostrum for the human baby that many children do not get because their mothers choose not to breastfeed. Thank you for the very informative article. I am going to try it! What an eye-opener! From what I’ve read here, I have to ask, why would anyone purchase any other brand of colostrum? Thank you for saving me days of research and for providing all the information one could want/need in one place! Do you receive any financial incentives or have any connections to Surthrival or their associated companies? The way this is written it seems like an ad and comes across as scripted? This is Nick, owner of the site. Yep, I do, please see the affiliate disclosure down the bottom of the site mate. It’s not much from such a product to be honest though, and I’m going to be more clear about this in future with supplements. Diet and supplements and the results you can achieve from their use is sooooo highly personal, that it’s almost useless me saying anything general about the product and its efficacy. It may work for you, it may not, I honestly couldn’t tell you. This is why these days I’m a big proponent of using something like 23andme.com to get your genetics worked out (you’ll need expert help interpreting them too). Knowing your personal genetics/biology is pretty much crucial for being able to improve your health, and will give you a lot of valuable insights. I would love to know how is it for kids especially for those on Autism spectrum. Can it have any effect on their brain function improving overall Autism symptoms? Or any other benefits for kids, the dosage to use? Can it be mixed into their regular bottle of milk without them noticing a difference in taste? I’m not aware of any research into that DJ, though I may have come across some at the time. Therefore I cannot comment, sorry.